February has been a great month for me for many reasons. 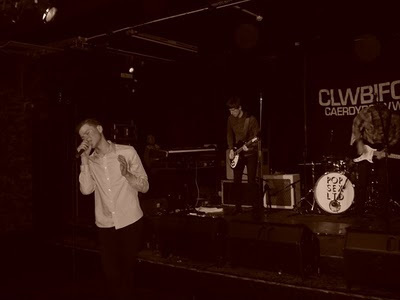 I got to go and see one of my favourite bands at the moment- Frankie and the Heartstrings in Clwb Ifor Bach in Cardiff and I had the best time ever and got to interview the band with my friend Emma. Sorry to everyone who follows me on Twitter because I haven't stopped talking about the band but I really do love them, you can check out my fave song by them here. I've been offered more hours at work which takes me up to pretty much full time hours now which I'm so happy about because it means more money for dresses and going to more gigs :) As you can see from the (dodgy web cam) picture above I also got my fringe cut back in. I hope March is even better than this month and I can't wait to see what happens! Loving: My job. I'm so happy where I am at the moment, it's such a nice place to work and my colleagues are all lovely. I'm also well into nail art thanks to Charlene and Sarah. I'm loving the Champagne shade of Models Own polish that Sarah sent me, so metallic and doesn't chip! Listening to: Frankie and the Heartstrings new album that was released on Monday, Robyn and some old favourites like Morrissey and New Order. Wanting: A day away to visit some castles in Wales or go to Hereford, I really want to go on a road trip. Reading: The Reader by Bernhard Schlink and Generation X by Douglas Coupland. Making: Not much this month, no baking because I'm cutting back, I lost 11.5 lbs last month. Feeling a lot more confident. Watching: The Runaways (which wasn't as bad as I thought it would be) Being Human series 1&2 which I now totally love, I got the box set of both series for about a tenner which is a bargain. Planning: To go to more gigs. I want to see Metronomy when they play in Cardiff soon and I'm planning on going to see Pulp and go to Greenman Festival in the summer. 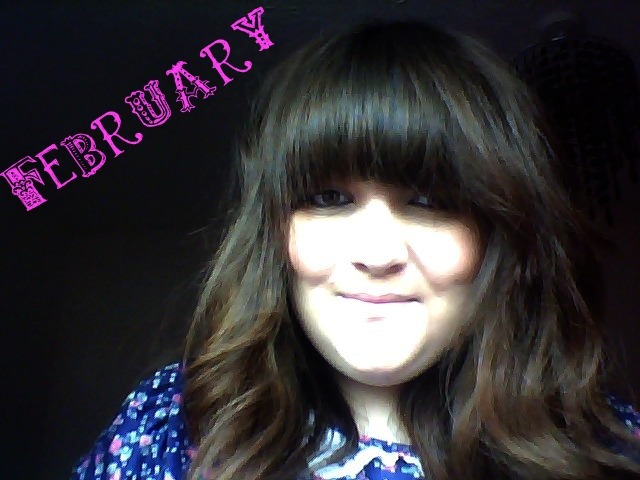 Everyone have a great February? What are your plans for the next month? Is there anything you think I should check out in March, new books, bands or places to go? Oooh saw Metronomy live before, they are just wonderful! Do enjoy, super jealous. Also, was planning to go to Greenman last summer, but it sold out before I got tickets :( Definitely go, it looked so so good! aren't libraries the best places to work? :) i'm currently reading freedom by jonathan franzen and it's so good, you should read it next! also great house by nicole krauss has just been released and i've got that from work because i was on the waiting list. i love all her books so i hope this one is great too. Glad to hear you enjoyed the gig! Your fringe is super pretty - really works with that wave. Thanks Llara, it always looks nice when you're fresh from the salon, I need to find a friend who is a hairdresser that will blowdry my hair all the time! Generation X is a fantastic book. Check out The Philosophy of Andy Warhol by Andy Warhol. i really want to go on a road trip too - cant wait for summer! I'm glad you're liking your job, it can be so frustrating when it isn't so.. I'm ok with my job, but do have periods of time when I just hate it, but it's ok because I won't be doing it for much longer anyway, and then more exciting things should come yay! :) Have a great march! @Sarah- you should keep a food diary in a little note pad. I find it's easy to get carried away and it's good to reflect on what I'm eating. I can see where I am going wrong and how I could do better. Probably the best thing I've done.